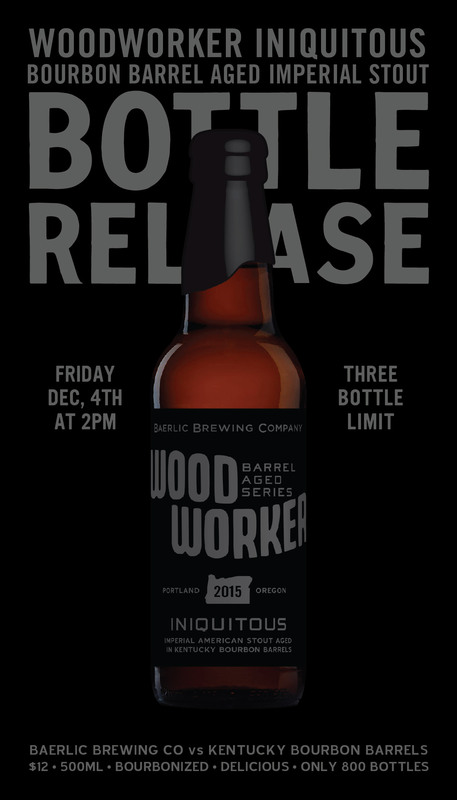 PORTLAND OREGON – Friday, December 4th at 2pm Baerlic Brewing Co. releases the newest beer in their WoodWorker barrel-aged bottle series, Woodworker Iniquitous Bourbon Barrel-Aged Imperial Stout. The Woodworker Iniquitous Imperial Stout weighs in at 8.5% ABV. This devilishly drinkable imperial stout bursts at the seams with bitter chocolate, bourbon spice and vanilla and finishes rich, roasty and dry. A taproom bottle release party will be on Friday, December 4th starting at 2 p.m. This party will include a special tapping of the WoodWorker Iniquitous at Baerlic’s Southeast Portland Taproom is located at 2235 SE 11th Ave.
A limited run of 500 ml bottles that are hand bottled, wax-dipped will go on sale for $12 each at 2 p.m.on Friday Dec 4th. Customers can purchase bottles to go with a 3 bottle limit per person. Woodworker Iniquitous Imperial Stout will also be available on draft. Woodworker Iniquitous Imperial Stout is the Kentucky Bourbon barrel-aged version of Baerlic’s Iniquitous Imperial Stout – an amped-up version of the brewery’s year-round Noble Oatmeal Stout. The name, which means “grossly unfair and morally wrong,” refers to the fact that “It’s just not right that so much epic flavor should be packed into just one beer,” says brewery co-owner Ben Parsons.“ Adding six months aging in Elijah Craig Bourbon barrels, definitely pushes it deep into the dark side,” adds co-owner Rik Hall. Baerlic’s WoodWorker Barrel-Aged Series are higher-gravity beers aged in a variety of repurposed spirits and wine barrels. Previous WoodWorker beers include Old Blood & Guts (Dry-hopped barleywine in Kentucky Bourbon barrels), Mountain of Gold (Tart Belgian-style golden strong ale in Oregon Pinot Noir barrels) and Thunderbolt Porter (Imperial Oatmeal Porter aged in both Kentucky Bourbon and Oregon Pinot Noir barrels.) The WoodWorker name reflects the owners’ love of carpentry and commitment to craftsmanship. Founded by longtime friends Ben Parsons and Rik Hall, Baerlic Brewing opened its doors on June 28, 2014. Parsons and Hall grew up together in Boise, Idaho and reconnected in Portland, where they began obsessively homebrewing together. After years of basement brewing and winning numerous awards in amateur competitions throughout the region the two gave in to the voices in their head and opened their 10-barrel production facility and taproom in SE Portland’s Hosford-Abernathy neighborhood. Baerlic’s Taproom, with 12 taps of Baerlic beer, is open seven days a week and Baerlic beer can be found on tap at more than 120 bars/restaurants throughout the Portland metro area. Baerlic (pronounced “bear-lick”) is an old-English term translating to “of barley.” The name reflects Parsons’ and Hall’s passion for brewing considered, honest and approachable beers that are guided, but not constrained by, historic styles and techniques. The brewery’s core brands include Cavalier Classic Cream Ale (a cream ale brewed with Himalayan Basmati rice), Primeval Hoppy Brown (a hoppy Northwest style brown) and Eastside Oatmeal Pilsner (a German pils brewed with oats for a silky mouthfeel). Baerlic also brews Invincible IPA, Noble Oatmeal Stout and a rotating selection of seasonal and specialty ales and lagers.